Los Olivos is one of five communities (with Ballard, Buellton, Solvang, and Santa Ynez) that make up the Santa Ynez Valley. The town is near SR 154, a scenic road from Santa Barbara over San Marcos Pass, through the coastal Santa Ynez Mountains. Los Olivos was connected by the narrow gauge railroad to points north as far as San Luis Obispo until the train made its last run in 1934. The southern terminus of the railroad was in front of Mattie's Tavern, where a stagecoach line continued over San Marcos Pass into Santa Barbara. The tavern is still in operation, and is one of the highlights of the area, with a well-respected restaurant and historic charm. 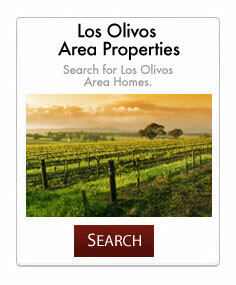 Los Olivos is renowned for its wineries and tasting rooms. Starting in Los Olivos and stretching north is the Foxen Canyon Wine Trail. The town is home to two expensive college-prep schools, Dunn School and Midland School. Dunn School is located along SR 154 and has both boarding and day students. Midland School is located on Figueroa Mountain Road and has only boarding students. Various celebrities have called this area home, including Cheryl Ladd, Noah Wyle, David Crosby, Bo Derek, Kelly LeBrock, Steven Seagal, John Forsythe, Ray Stark, Robert Cray, and Jimmy Stewart. Former US President Ronald Reagan lived about 9 miles south at Rancho del Cielo ("Sky Ranch"). Singer Michael Jackson's former property Neverland Ranch is located about 5 miles north. There are also a number of large thoroughbred horse ranches in the area, and Fess Parker's winery, featured in the movie Sideways, is around here. Mr. Parker and his wine were featured on the NBC daytime drama, Santa Barbara ( first episode of Season Two ) of James May and Oz Clarke's Big Wine Adventure. Episodes of The Bachelor were also filmed in Los Olivos. In May, 1986, Los Olivos was used as the location setting for the fictional town of "Mayberry" in the made-for-TV movie Return to Mayberry, based on the popular 1960s sitcom The Andy Griffith Show. Several locations in Los Olivos were featured in the 2004 movie Sideways. The Los Olivos Grand Hotel, built in 1985, is now Fess Parker's Wine Country Inn, owned by former Daniel Boone and Davy Crockett star, Fess Parker.